Cala Llonga is a place with an amazing landscape; an ideal enchantment suitable for people who travel with the family as well as for young people who love sport and aquatic fun. Access: asphalted road, either from Sta. Eulalia taking the indication located between km. 11 and 12 of Ibiza to Sta. Eulalia"s highway, or from Ibiza, in this case previously crossing through Jesus. Beach dimensions: 200 m. lenght and 100 m. wide. Type: White and fine sand of natural origin, both on the beach and below the water. 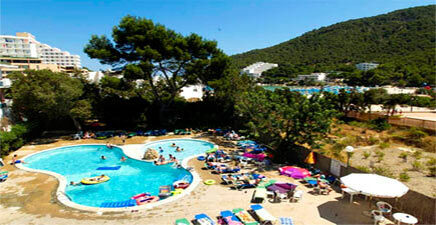 Services: Tourist residential zone with all type of services: showers, parasols, sun beds, boat rent, volley, diving school. Restaurants, bars, supermarkets, souvenirs, car rentals. Boats service from Cala Llonga to different places: Sta. Eulalia, Ibiza, Formentera island and other beaches.